Posted October 5th, 2015 by Mike Boyes & filed under Memory, Neuroscience. Description: In introductory psychology classes like the one I teach we often talk about the critical role that the hippocampus seems to play in memory processes. But we don’t do is talk about just what goes on in the hippocampus as its playing its role in the memory formation process. The article discussed in this Science Daily blog looks at one of these processes: the one concerning how memory processes are turned on in the hippocampus. If you have had an introductory psychology course with a section on memory you’ve probably heard about HM, a man who had most of his hippocampus removed an effort to cure his epileptic seizures. 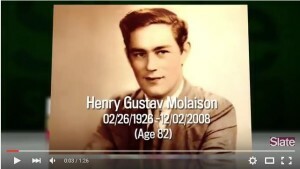 HM was Henry Molaison and the consequence of this surgery was that he completely lost the ability to form new long-term memories. Research described in this article conducted by the Institute for brain science in Korea seems to have identified mechanisms by which a memory inhibitor in the hippocampal region is turned off when novel information is presented allowing the hippocampus to process that new information into memory. In general terms what does this research suggest about how the hippocampus performs its contribution to the memory process? Do you have any concerns about the claims made the threat to human memory in light of the fact that this research was conducted with mice? How does the experience of HM relate to the information on hippocampal function described in this article? Penfield, W. (2015). Mystery of the Mind: A Critical Study of Consciousness and the Human Brain. Princeton University Press.